Rupert Pupkin Speaks: Warner Archive TV Grab Bag - SPENSER FOR HIRE Season 1 and HARRY O Season 2 ""
There were many television programs that I watched regularly with my family when I was growing up. MAGNUM P.I., SIMON & SIMON, KNIGHT RIDER, MACGYVER and MIAMI VICE to name a few. SPENSER FOR HIRE was another big one for us as well. The show debuted on ABC on September 20th, 1985. Also premiering around that time were the likes of THE GOLDEN GIRLS, 227, IT'S PUNKY BREWSTER, GROWING PAINS, SMALL WONDER, THE EQUALIZER, AMAZING STORIES and the aforementioned MACGYVER. It was a big month for TV and a ton of shows that kids of the 8os (like myself) remember quite fondly (and still continue to try to hoist upon our children). 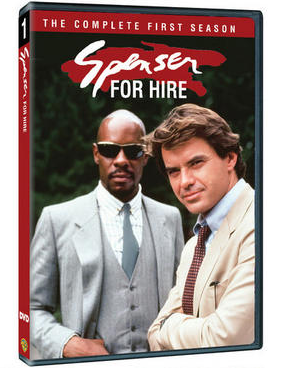 SPENSER was certainly one of my favorites from the fall of '85 and though it only lasted a few seasons, we made sure to watch it whenever it was on. Spenser introduces himself as "Spenser with an 's'. Like the poet." He means Edmund Spenser who apparently wrote about adventures, chivalry, knights, honor and truth. All this in his most epic poem The Faerie Queene, which was six books long and is one of the longest poems in all of the English language. Anyway, the poet Spenser ties into the detective Spenser in his own codes of honor and truth. The pilot even features an interesting logo for the show which consists of a knight's shield and a man kneeling and pointing a gun (which I guess was scrapped in later episodes). By the second episode, this knight has lost his place to live and takes up residence in a previously unoccupied fire house. I've always found that to be among the coolest "pads" that any TV show character ever had. Also, it gives him something in common with the GHOSTBUSTERS, which is awesome. Good TV can often be about good chemistry. Robert Urich and Avery Brooks (who plays "Hawk" on the show) have that chemistry. The characters of Spenser and Hawk go together like few other dynamic duos in television history. Spenser is great and a character I like a lot, but Hawk is the reason I love the show. Hawk speaks with the pure annunciation and cadence of cool. He has a huge DIRTY HARRY type handgun that he carries as a signature item (along with his super-cool sunglasses). He is just one of those "close-to-the-vest" kinda characters that rewards your viewership with subtle gestures and bits of dialogue. He, like Spenser, is a fiercely loyal guy and that is one of those character traits that seems to really hook me in TV and movies and also in real life. I dig Hawk so much I might go so far as to call him one of the greatest characters of 80s television in general. Harry Orwell is ex-cop turned beach bum detective living in San Diego. He was forced to leave the police force when he sustained a debilitating spinal injury and has taken to being a private detective in his spare time. Orwell is an interesting almost flipside to Spenser, but the two are both fiercely intelligent, driven ex-cops who can't help but keep pushing out of a sense of loyalty and a moral code to see that the right thing is being done. Orwell is occasionally a bit looser with his ethics, but is nonetheless a great detective. I personally miss the time when a guy like David Janssen was a television star. Known primarily for his hit show THE FUGITIVE, he is a favorite underrated actor for me and to see him at the center of a program like HARRY O is just outstanding. 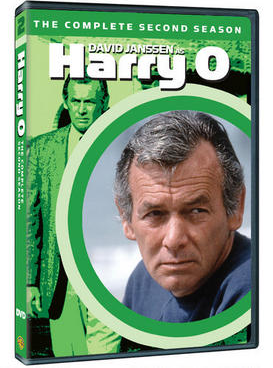 Janssen was about 44 years old during the second season of HARRY O. He was not a conventionally handsome dude in the vein of a Burt Reynolds or other such popular movie stars of the period. He had gravitas though and we have lost sight of that a little bit with the TV actors of today. A lot of that gravitas came from his amazing voice. It is the voice of a man who sounds like he's just finished gargling with razor blades before each scene. As with the "lived-in" faces of character actors of this period, I also miss memorable voices. Those haven't totally gone away, but in our pursuit to have the neat, clean, trim handsome stars of today, a guy with a gravelly voice doesn't necessarily take priority and that's too bad. I think of HARRY O as another of those "Warner Archive titles" like NICHOLS and THE LIEUTENANT which are all shows that WAC has brought back into the conversation with their DVD releases (and through their streaming service). I really think it's just a matter of time before HARRY O shows up on Warner Archive Instant so more folks can check it out. The second season starts out with a bang (pun intended) with the story of a police Lieutenant (Anthony Zerbe) who is framed for the murder of a junkie snitch. One of the things I love about this show and 1970s television in general is the amazing river of remarkable guest stars they used to have. This particular episode features Rene Auberjonois, James Hong, and Gordon Jump among others and that's a low-key round of guests for this show. It is an endlessly fascinating game for me to watch the opening credits for who the guest stars on each episodes are. I will often squeal with audible glee when names like Larry Hagman, Lou Gossett Jr., Robert Loggia, and Anjanette Comer pop up. It's just a well-made show and with great actors like these you can't go wrong. It was particularly interesting to watch it after having watched a bunch of SPENSER FOR HIRE though as the Southern California locations of HARRY are certainly distinctly different from the Boston of SPENSER. Both are excellent shows, produced about a decade apart. It is intriguing to see how TV changed as far as the way stories were told episodically in one decade versus another. I recommend watching both shows back to back as I did for added enjoyment of both.